Rich Piana 5% Nutrition Real Food Bar is a healthy and nutritious protein bar that contains only natural ingredients. It’s an excellent source of protein, carbohydrates with a low glycaemic index, valuable fats and fibre. It’s free of sugar, artificial fillers and any chemical substances. The vast majority of protein bars available on the market are based on artificial ingredients, it’s filled with sugar and harmful trans fats. Manufacturers base themselves on catchy slogans that emphasize high protein content as the most beneficial macronutrient, leaving aside all the rest. Against this background, the presented bar definitely stands out with its composition and outclasses the competition in every respect. Only natural ingredients from the highest shelf were used for its production. Proteins are derived from egg whites and not from soy or collagen proteins that are used in similar products and are commonly added to, for example, sausages. Sweet potatoes and oats are used as a main source carbohydrates, which is characterized by a low glycaemic index, which eliminates the risk of sudden, postprandial sugar spikes. The bar is free from harmful trans fats, provides valuable nut fat and certified palm oil. It’s worth noting the presence of prebiotic fibre from tapioca. It’s important in regulating the digestive process, and as a nutrient for probiotic bacteria it helps to build the desired intestinal microflora. The bar does not contain any additives that could raise doubts of people who care about health and figure. Its composition is free of sugar, aspartame, preservatives, dyes or fillers. The distribution of macronutrients is important especially for athletes, and it’s mainly them who reach for protein snacks. The presented bar is well balanced in terms of macronutrients. In one serving you can find up to 20 g of high quality protein of the highest quality, which provide all the necessary amino acids. Some may worry about the carbohydrate content. It’s worth noting, however, that with 26g of carbohydrates in a portion, 10g of it is fibre. What's more, the manufacturer's choice fell on very valuable complex carbohydrates, characterized by a slow rate of absorption. Thanks to this, the bar adds stable energy and sates for a long time. It should also be remembered that active people do not have to worry about carbohydrates, because they are the most important "fuel" for the body exposed to intense physical effort. Another important macronutrient is fat. The presented bar contains relatively little fat, and comes from very valuable sources - nuts and certified palm oil. Users appreciate Real Food bars for their excellent taste qualities. Indeed, thanks to the use of natural ingredients, the bar tastes like real food and is devoid of a chemical aftertaste. Amateur protein bars often complain that they are unnecessarily covered with a glaze, which is reminiscent of caramel or chocolate, and their interior is filled with suspicious crisps of unknown origin. Because of this, snacks become not only unhealthy, but also nauseous. The presented bar is not too sweet, and has a balanced, subtle flavour. The Real Food bar was designed by a person professionally associated with sport, so the recipients are supposed to be physically active people. In fact, it’s ideal as a snack to use around training time. It gives an injection of necessary energy and secures the supply of key amino acids derived from a wholesome protein. The portion has an ideal grammage, eaten even just before the training does not burden the digestive system, and satisfies the hunger and energy demand of the body for a long time. The bar can also be eaten by people who are not physically active, and simply eat healthy food and pay attention to the quality of consumed products. In this case, it will be an excellent alternative to unhealthy, sweets. On an exceptionally busy day, such a bar can even replace one well-balanced meal. 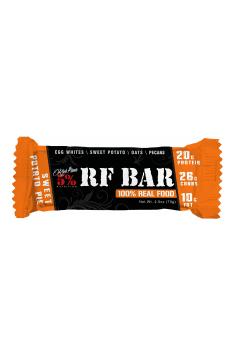 To sum up, Rich Piana 5% Nutrition Real Food Bar is a full-fledged, and at the same time healthy, treat. The bar contains the same natural ingredients of the highest quality. It’s ideal for both athletes and people who attach great importance to the diet. Recommended as a snack or nutritious variety of everyday menu. Eat 1-2 bars a day. The amount of bars consumed should be adjusted to the individual daily calorie needs. Natural ingredients were used in the production of the bar, which is why it’s exceptionally healthy and can be recommended to almost everyone. Due to the increased protein content, it’s ideally suited to the diet of people who have an increased need for protein. The bar can be treated as a snack, and in exceptional cases it can be a substitute for one meal. * Values may vary slightly depending on the taste. Egg Whites, Prebiotic Fibre (From Tapioca), Sweet Potatoes, Yams, Pecans, Organic Palm Oil (certified Sustainable), Sunflower Lecithin, Water, Oats, Sucralose, Natural Flavours, Orange Pulp, Sea Salt, Cinnamon, Nutmeg, Blueberries.